DUMBARTON eased past division one side Raith Rovers 2-0 in the quarter-final of the Irn Bru Cup at the YOUR Radio FM103 Stadium. 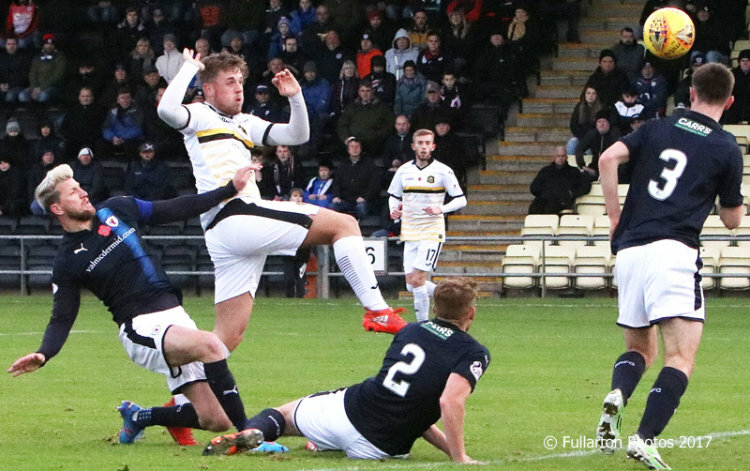 DUMBARTON eased past division one side Raith Rovers 2-0 in the quarter-final of the Irn Bru Scottish Challenge Cup at the YOUR Radio FM103 Stadium in front of an 888 crowd. Manager Stevie Aitken made one team change from the win against Brechin City with Craig Barr replacing Dougie Hill. Sons started the match in a bright fashion and Calum Gallagher tested Smith in the Raith goal with a long range header. McLaughlin broke the deadlock for Sons on 20 mins converting from close range following a Tom Walsh corner — his first ever goal in senior football (pictured}. Rovers though came close out the half hour mark when ex-Son Lewis Vaughan just failed to connect from a cross with keeper Scott Gallacher beaten. Sons created a few more chances and held their lead till half time. Four minutes into the second period Ally Roy doubled Dumbarton's lead, capitalising on a defensive mistake. Tom Walsh then missed a penalty and Raith were reduced to ten men when Greig Spence was shown a red card for handling the ball on the goal line. Dumbarton comfortably saw out the game and now await the outcome of the semi-final draw.